Research at the Royal Museum for Central Africa and the Royal Belgian Institute of Natural Sciences has revealed a treasure-trove of natural history in the form of dental elements. Teeth, one of the hardest and most easily preserved biological tissues, provide evidence of diet, ecology, use and life cycle stage. At the Royal Museum for Central Africa, I recently finished my examination of Old World monkeys, including Cercocebus agilis, an extractive forager, Colobus angolensis, a leaf-eating monkey, and Papio anubis, a generalist and terrestrial forager. These taxa will provide distinctions in dental microwear, including those produced by hard foods, tough foods and grit, respectively. Over several weeks, I will be creating dental molds from chimpanzees and gorillas to help reconstruct the past diets of semi-terrestrial and terrestrial forms. At the Royal Belgian Institute of Natural Sciences, in addition to documenting, photographing and molding the teeth of 4,000 year old Neolithic (new stone age) teeth from the Meuse River Valley, I have also discovered a false temporal mandibular joint on the lower jaw of an adult. My Belgian colleagues and I will be preparing a case report for an international journal over the next few weeks on this unique articulation. This kind of collaboration with my Belgian colleagues will form the foundation for working together in the future to reconstruct diet in the earliest farmers of Belgium. 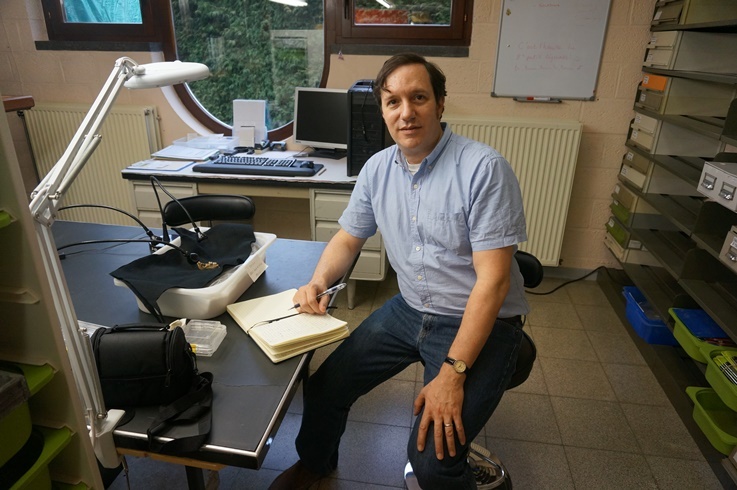 In addition to studying the “recent” past of Belgium, I have also had the opportunity to examine the Neandertal fossils from Scladina Cave in the province of Namur. The observations from dental casts will be included in a larger study on Neandertal dietary proclivities across the life cycle. I was recently invited to the Belgian American Educational Foundation (BAEF) meeting for U.S. scholars in Belgium at the Fondation Universitaire Stichting in Brussels. In attendance was the president of the BAEF, Dr. Emile Boulpaep, who was also the president when I awarded a BAEF fellowship as a graduate student for study in Belgium. The BAEF was founded by Herbert Hoover using the funds remaining from relief efforts supplied by the American Friends of Belgium in the aftermath of World War I. Mr. Hoover later because the President of the United States. 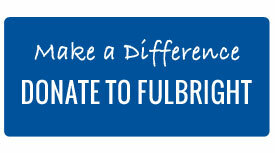 I was also fortunate to attend two events sponsored by the Fulbright Office of Belgium and Luxembourg, including a reception at the U.S. Embassy to Luxembourg and a European Union seminar retreat at the College of Europe in Bruges, Belgium. It was a pleasure to learn more about the European Union and the projects of various Fulbright scholars from around the continent. And finally, I gave a lecture at the University of Liège on reconstructing diet using dental microwear as well as my current projects in Belgium. 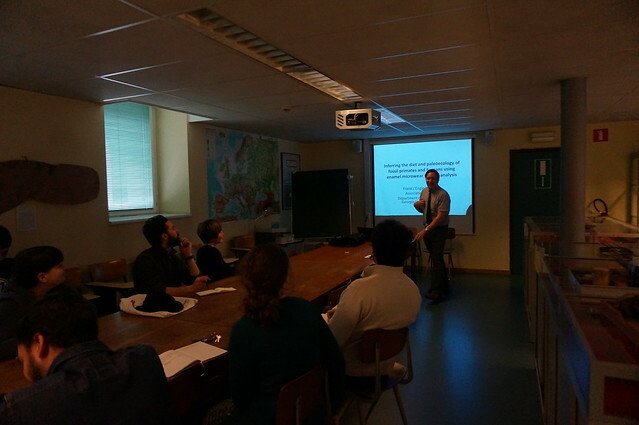 The lecture was held in the Musée de Préhistoire in the Sciences Historiques building of the University of Liège in the historic core of the city, and was attended by graduate students, faculty, post-docs and Ph.D. students in Prehistory. The lecture was followed by a lively question and answer period and lunch. 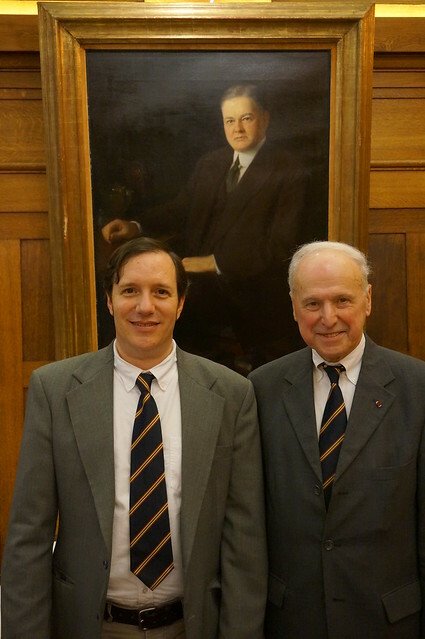 Dr. Williams gives a lecture at the University of Liège.